Emory physicians including Douglas Ander, MD (center) will train physicians and nurses in the country of Georgia based on successful medical and nursing education programs at Emory. The Ministry of Health in the country of Georgia has awarded Emory University School of Medicine physicians a $686,000 grant to establish simulation-based training programs for every physician and nurse in that country. Internal medicine physicians Kenneth Walker, MD, and Archil Undilashvili, MD, and emergency medicine physician Douglas S. Ander, MD, will lead the program in a newly established state-of-the-art training center in Georgia. The funding will allow Emory physicians to enhance the education of doctors and nurses in Georgia with the support of numerous Emory faculty from multiple departments who will develop and implement the training curriculum. "This is an unprecedented opportunity for an academic institution to change the quality of health care in an entire country," says Walker. "Attainment of this grant was achieved by building on previous work in the country of Georgia by many Emory faculty and departments, developing curricula and training programs in nursing and medicine." "We are proud to be part of this commitment to medical education and to assist the health care providers of Georgia in improving the quality and outcome of delivered health care services country wide," says Ander. Emory University has been involved with the development of Georgia's health care and education sector since 1992. Emory's association includes a number of successful projects, such as development of the national AIDS and Safe Blood Program; faculty and student exchanges; establishment of modern public health services; training more than 100 physicians, public health professionals, business professionals, and attorneys; development of the first pediatric emergency room and service; and establishment of the first modern business school, "Caucasus Business School," with Georgia State University. The Emory partnership was awarded the USAID Outstanding Citizen Achievement Citation in 2006. 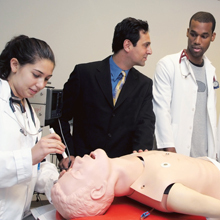 In 2007 Emory, along with Partners for International Development, established the Kobaladze Center for Research and Experiential Learning for the training of physicians and nurses. The center, which is modeled on the Emory School of Medicine's Center for Experiential Learning, has provided continuing education courses for 25 emergency medicine specialists and 3,000 nurses. Emergency Medicine: A program funded by USAID ($1.2 million) and spearheaded by the Emory Department of Emergency Medicine trains physicians from other specialties over an eight-month period to be certified as emergency department specialists. Nursing Education: A program funded by USAID ($2 million) trains practicing nurses with a one- to three-month intensive skills update. Three thousand nurses have been trained thus far in a new program that consists of 60 percent didactic training, 20 percent clinical training, and 20 percent simulation training. First Lady of Georgia Sandra Roelofs and First Deputy Minister of Health Irakli Giorgobiany successfully completed the course in July 2012. Medical School Curriculum: A program led by Gordon Churchward, PhD, will entirely change the existing medical school curriculum at Tbilisi State Medical University in Georgia with a new curriculum modeled after the curriculum at Emory School of Medicine. Two pilot classes will be admitted in Fall 2012 consisting of both Georgian and International students from countries including India, Nepal, Trinidad, Tobago, and others. Ten Emory University faculty and staff will travel to Tbilisi in September 2012 to inaugurate the new program and teach the first week of class on "Becoming a Doctor."